Etihad Airways is the national airline of the United Arab Emirates and is based out of Abu Dhabi. Launching in 2003, Etihad quickly established itself as one of the world’s premier airlines, winning the World Travel Award for The World’s Leading New Airline in 2004. Since then, the airline has received over 170 awards for its outstanding service and facilities. The airline’s main strengths lie within its focus on onboard comfort and luxury. 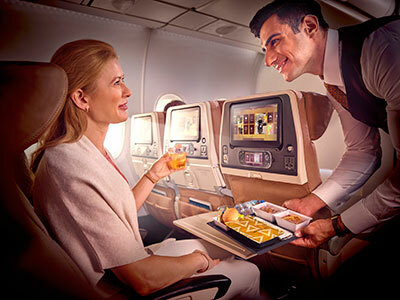 Etihad Airways' Economy Class boasts a range of benefits that make it one of the world's most prestigious airlines. Guests flying in Economy Class can expect the choice of three different high quality meals, complimentary bar service, in-seat power offering the ability to charge personal electronic devices and a unique pillow that converts to a neck pillow to help guests sleep. There's also the Economy Smart Seat on the A380 aircraft, which is the ultimate in clever design with a unique 'fixed wing' headrest to make the journey even more comfortable. The mood lighting system helps provide a relaxed ambience throughout the flight. Subtle changes are designed to stimulate calm sleep, so you arrive at your destination feeling rested and refreshed. Stay entertained with hundreds of hours of on-demand entertainment – including live TV and sports – on your personal 11-inch touch-screen TV. Remain connected with mobile and internet access. The luxury, comfort and service offered in Business Class equates to that of First Class on many other airlines. The modern design and thoughtful features create a sense of space and freedom, with direct aisle access, convenient storage spaces and mood lighting. The seat converts into a comfortable fully-flat bed of up to 80.5 inches. Relax on all ultra long-haul flights on special mattresses for bedtime comfort in complimentary loungewear. A large personal 18-inch touch screen TV with noise-cancelling headsets delivers hundreds of hours of entertainment including the latest blockbusters, timeless classics and interactive games. With a special pneumatic comfort system to adjust the firmness of the seat, in-seat massage and lighting, all at the touch of a button, guests can customise their perfect environment for every stage of the journey. 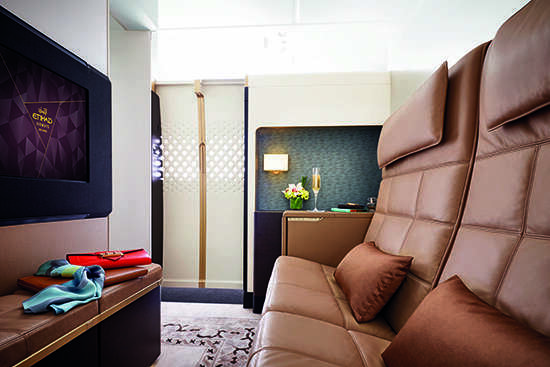 Upping the ante in luxury and privacy, Etihad has revolutionised First Class with First Apartment, available on the A380. More than just a seat, it has a large leather armchair and separate bed that stretches 6ft 10in. There's even space to walk around after closing the privacy doors. A companion can also join you for a meal in your spacious First Apartment and, when travelling with a partner, the divider between Apartments can be lowered to conjoin rooms. There's also 'The Residence', available exclusively on the airline’s new A380 which operates daily flights to London Heathrow. All First Apartments are upholstered with the finest Poltrona Frau leather and feature a wide armchair, an ottoman and even include space to walk around in. The ottoman also opens out into an 81-inch long bed. The First Apartments also come equipped with an adjustable 24-inch flat screen TV, which can be viewed from the armchair or while relaxing in bed, together with a vanity cabinet with ample lighting and space for your personal effects, a chilled drinks cabinet and a wardrobe. Freshen up before arrival with exclusive amenities and an energising shower in the First Class bathroom. A truly unique and bespoke travel experience, delivered with complete discretion and limitless hospitality. Designed for up to two guests travelling together, it has been created by leading interior designers and hospitality experts who understand the discernment and sophistication expected by the private traveller. 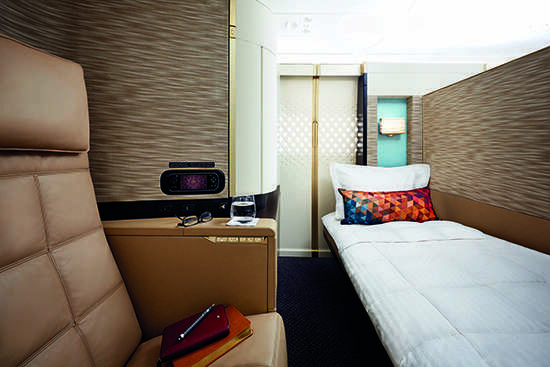 With a living room, separate bedroom and ensuite bathroom, The Residence by Etihad is the only three-room suite in the sky. Etihad's VIP Travel Concierge Service takes care of guests booked into The Residence from the moment of reservation right through to the end of their stay with Etihad. From a luxury chauffeur to private check-in and lounge, we have designed every part of the travel experience to be seamless and discreet. 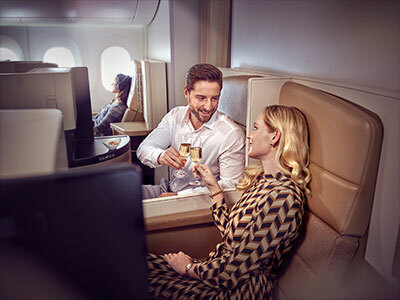 Guests travelling in Business Class with Etihad Airways are treated to 15-inch LCD TVs and noise-cancelling headsets to enhance the in-flight entertainment experience. Hundreds of hours of hit television shows, classic movies and the latest music from around the world is loaded into the on-demand E-BOX system for your convenience, which can also be accessed using your personal devices. In-flight entertainment for First Class guests includes a 23-inch widescreen for personal viewing using the E-BOX system, plus noise cancelling headphones and connectivity to power your personal electronic devices. First Class guests also receive mobile phone and Wi-Fi access on selected routes and aircrafts. For more details on why we recommend flying premium with Etihad Airways, see our First and Business Premium Airline Guide. Guests travelling in Economy Class on Etihad Airways may take one carry-on bag weighing up to 7kg, while Business and First Class passengers are allowed two bags with a combined weight of 12kg. Maximum dimensions per bag: 50 x 40 x 25cm. All passengers are allowed to take one personal item onboard. It must fit under the seat in front – for example, a handbag, a laptop bag or duty free purchase. If any of you baggage exceeds these set limits, you will be asked to check your baggage into the hold. Additional baggage charges may apply. Checked baggage allowances onboard Etihad vary depending on the type of airfare. Generally speaking, for entry level airfares, Economy Class guests are allowed one bag of up to 23kg. Business Class passengers receive a baggage allowance of 40kg, while First Class travellers are entitled to 50kg. Premium travellers may take more than one bag, but each bag must not weigh more than 32kg. Excess baggage fees can be steep, so try to weigh your luggage at home or the hotel before you leave for the airport. Certain items such as sporting gear, musical instruments and film equipment can be taken as checked baggage provided they don't exceed the weight and size dimensions set by Etihad Airways. If the items are over the checked weight limit, they will be charged as excess baggage. Bulky items that are accepted as checked baggage include skiing equipment, surf boards, bicycles, golf clubs and scuba diving equipment. For more information, speak to your Flight Centre Airfare Expert. Adults travelling with infants or children up to 11 years old are able to take a collapsible stroller or carry-cot as carry-on baggage in the cabin (provided there is space), or as checked baggage. This service is free of charge and in addition to the standard checked baggage allowance. Etihad Airways has a 'Flying Nanny' service on all long-haul flights: a dedicated childcare assistance program available both onboard and on the ground. There are several items that are strictly prohibited from being taken as either carry-on or checked baggage. These items include explosives, imitation explosive devices, aerosol spray paint, paint thinner, alcoholic beverages exceeding 70% by volume and any fireworks, flares or pyrotechnics (including party poppers and sparklers). Certain objects are unable to be taken in the aircraft cabin but are allowed as checked baggage. This includes baseball/cricket bats, skateboards, tools with pointed or sharp edges, ice skates and fishing rods. For a full list of restricted items, please refer to the Etihad Airways website or contact your travel consultant. Buy small padlocks to lock the zips on your checked baggage for extra security. Etihad Airways gives their guests the option of checking in online from 48 hours up to one hours before departure. Using your booking reference or Etihad Guest number on the Etihad Airways website, you can choose your seat and print your boarding pass at home to save time at their airport. Please note that online check-in is not available for codeshares. You can also get your boarding pass on your phone – simply complete your online check-in at least three hours before your departure, using a mobile device. If you're flying with Etihad Airways from Abu Dhabi, you can check-in at one of the city check-in facilities. City check-in opens 24 hours prior to departure and is located at Abu Dhabi's City Terminal, directly opposite the Abu Dhabi Mall. This method incurs a fee of AED 30 per guest (excluding infants). At the Abu Dhabi International Airport, Etihad Airways travellers can check-in from four hours up to 60 minutes before departure time. Check-in for Business Class passengers closes 45 minutes prior to the scheduled departure time. Amid all the other premium perks, guests can also enjoy the well-appointed interiors and warm service of luxury lounges. Lounges are available in London (pictured below), Paris, Frankfurt, Dublin, Manchester, Sydney and Washington DC. In Abu Dhabi, Etihad's Arrivals Lounge gives you the chance to freshen up after your flight, take a shower while we steam your clothes back to perfection, or take advantage of a wet-shave facility, or enjoy a light international buffet. 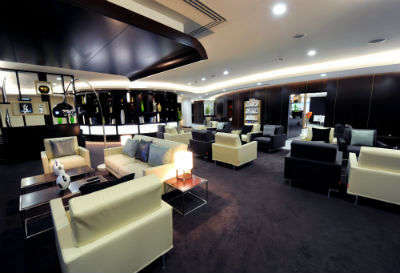 Read more about Abu Dhabi lounges below. First Class, Business Class and Etihad Guest Silver, Gold and Gold Elite members are granted access to Etihad Airways' luxurious lounge at their hub in Abu Dhabi, as well as at a selection of other locations and partner lounges around the globe. Etihad Airways' Business Lounge in Terminal 3 at the Abu Dhabi International Airport is all about comfort and convenience. Refresh before your flight with a shower as your shoes are polished and clothes neatly pressed, or visit the Six Senses Spa for a therapeutic 15 minute treatment. As well as the global lounges already mentioned (London, Paris, Frankfurt, Dublin, Manchester, Sydney and Washington DC), Etihad Guest members are also granted access to a number of partner lounges worldwide thanks to Etihad Airways' codeshares. The list runs long and includes the likes of the Royal Orchid Lounge in Bangkok, Wingtips Lounge in New York and the Air New Zealand lounges in Brisbane, Sydney and Melbourne. The Etihad Guest frequent flyer program has four unique tiers, each designed to reward loyal patronage and enhance your journey from start to finish. Moving up through the tiers is calculated by your mileage travelled as well as cabin class. From your very first flight you can enjoy immediate rewards by signing up to the Etihad Guest program. The Etihad Guest membership gives you access to the online Reward Shop where you can redeem Etihad Guest Miles for things such as holidays, fashion and more. You can also upgrade your flights using your miles, pool your points with family members and earn extra miles when you shop, stay or drive with Etihad Airways' partner businesses. To be upgraded to the Silver tier of the Etihad Guest program, 25,000 miles need to be accrued over a 12 month period. Silver tier membership gives you access to the Reward Shop, as well as waitlist priority for busy routes and a guaranteed Economy seat even on sold out flights if you book with 48 hours notice. Silver members are also able to upgrade to a higher cabin using their miles, receive an excess baggage allowance of 10kgs and have access to the Business Class Lounge. To maintain Silver status, you need to accrue 20,000 miles in the following year, which is made a little easier with 25% bonus miles for every Etihad Airways flight you book. Etihad Guest Silver members automatically achieve Gold status when they clock up 50,000 miles over 12 months. To keep Gold status, 40,000 miles need to be travelled but a 50% bonus on miles makes that even more achievable. Gold guests are given an extra 15kg baggage limit plus a guaranteed Economy seat if booked with 24 hours notice. Gold members receive all the benefits of Guest and Silver levels as well as priority check-in and boarding, fast-track immigration and a chauffeur service taking you door-to-door when you travel in Business or First Class. The top tier of the Etihad Guest program is reached after 125,000 miles are accrued over a 12 month period. Exclusive benefits include all of those awarded for Guest, Silver and Gold levels, plus access to the prestigious First Class Lounge, an extra 20kg baggage allowance, first-class check-in and a guaranteed Business Class seat if booked with 48 hours notice. To keep Platinum status, 100,000 miles must be earned in the following year but there is a 75% bonus on miles to help keep you on track. A member of your family also receives complimentary Silver status.